There is little dispute that over the last ten years far greater recognition has been accorded to global responsibility for the environment, and as a consequence a wider acceptance in the developed world of the US model of strict liability in respect of environmental harm. 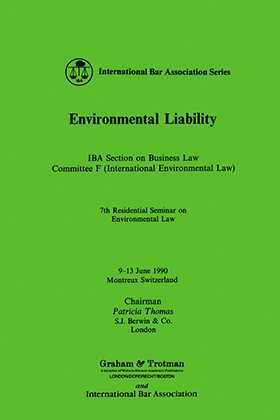 This volume presents the widespread and informed debate on the subject undertaken by the Environmental Law Committee of the IBA's Section on Business Law. The philosophical and economic concept of sustainable development is addressed, as is the response required from financial and political institutions. The role of international agencies is examined. Regional perspectives on such liability are given (Europe, North America, Asia, Africa and Australasia) and insurance, indemnities, non-fault liability and environmental impact assessment are evaluated as means of securing responsibility. The effectiveness of enforcement -- an area of potentially far-reaching legislation across a range of jurisdictions -- is closely examined and clear developments and trends are identified. The implications of liability continue to involve corporate and banking lawyers and insurance litigators, surely placing upon the environmental lawyer an educative and pivotal place in the promotion of sustainable development and growth. The volume reproduces the edited and revised papers of the Committee's Seventh Residential Seminar, held in Montreux, June 1990, and faithfully reflects the wide range of expertise brought to bear on the subject.